The 2016 River of the Year logo (above), which features a painting by Wyalusing native Brian Keeler, was recently unveiled to community leaders in Tunkhannock (top) and Towanda (below). It will be part of a media kit that will be sent to all groups known to be planning river-related activities along the Susquehanna River North Branch during the coming year. 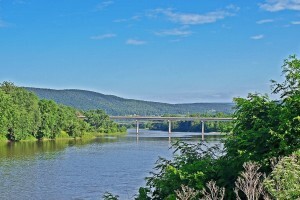 For the first time since 2004, the Susquehanna River North Branch has been designated by DCNR and POWR (Pennsylvania Organization of Watersheds and Rivers) as “2016 River of the Year.” The waterway, which is also part of the National Parks trail system, was sponsored for the contest by Endless Mountains Heritage Region (EMHR) and Susquehanna Greenway Partnership (SGP). The two organizations will now share a $10,000 grant to be used to promote and enhance river-related activities planned for 2016. EMHR has taken the lead in getting the message out to communities in Bradford, Luzerne, Susquehanna, and Wyoming counties, through which portions of the historic river flow. At meetings held so far in Tunkhannock and Towanda, EMHR Greenways Coordinator David Buck unveiled a new logo that will be distributed as part of a media kit designed to assist municipalities and civic groups in promoting their respective events. Another focus of the sponsoring associations is the completion of applications by communities situated along the waterway to achieve official Susquehanna Greenway designation as a River Town. So far, only Laceyville, Sayre/Athens, and Shickshinny have completed the process, with applications underway in Tunkhannock and Susquehanna Depot. Interest has also been expressed by Towanda officials to be designated as a River Town by this summer. The list of river-related events that could benefit from the River of the Year designation is growing quickly. Buck proposed about a dozen known events when he met with representatives from in Wyoming County on Feb. 5. When he conducted the next meeting in Towanda on Feb. 9, the list had grown to nearly 20. Most of the events already have sponsors and focus on culture, commerce, entertainment, and heritage. The Wyoming County Cultural Center, for instance, was already scheduled to present a program about Moravian missionary David Zeisberger and his work among members of the Iroquois Nation at Friedenshutten near present-day Wyalusing. EMHR will initiate additional events that are focused on history and nature. Among these are Earth Day Art and Woodcock Watch at Vosburg, sponsored by Friends of the Howland Preserve and Endless Mountains Nature Center on April 22; West Pittston Library Paddle and Wine & Cheese event in June; Wyoming Valley Riverfest from June 24 to 26; Tunkhannock Founders Day, sponsored by the Tunkhannock Business & Professionals Association on June 25; A Garden Party at the Oldest House in conjunction with Laceyville’s Community Day on July 8 and 9; Tunkhannock’s River Day, sponsored by the Wyoming County Cultural Society on July 23; Rockin’ the River at the Howland Preserve on July 30; a Civil War Encampment at French Azilum in Bradford County on Aug. 13 and 14; Towanda River Fest from Aug. 18 to 20; and Berwick Riverfest on Oct. 15 and 16. A number of river sojourns are on the calendar, as are shorter paddling trips. Some will be advertised to the public, and others will be limited to specific groups like students. For example, approximately 70 students and teachers from school districts along the upper North Branch will be selected to paddle and camp for three days from Sayre to Sugar Run. Environmental and history speakers will join the students at various points along their journey, and the students will be encouraged to entertain each other each evening. “Some will be bringing guitars and other musical instruments to play around the campfire each night,” Buck explained. Whether the event is musical in nature, a community celebration, or a fundraiser that involves the river, EMHR and SGP directors are hoping that the leaders of organizations planning such events will take advantage of the forthcoming media kit, which will include the branding logo, full schedules, and sample press releases. 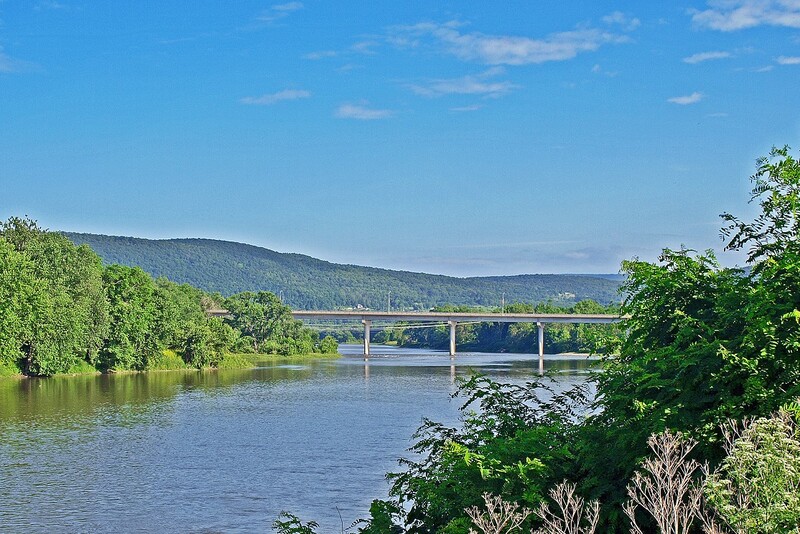 In the meantime, River of the Year sponsors are hoping to mobilize Scouts, church youths, and other groups to conduct cleanups along stretches of the Susquehanna River. EMHR can provide some assistance with needed supplies, coordination of dump sites, and promotion of such events. Those interested in organizing or participating in a cleanup this spring should contact Buck at EMHR at 570-265-1528. For general information about River of the Year or to request a media kit, interested readers may contact EMHR program coordinator Hillary Robinson at the same number.